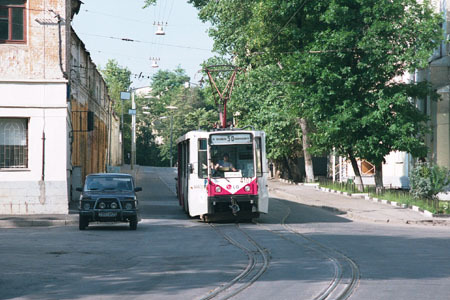 A very interesting place for any tramfan is located not far from Kurskiy Railway station in Moscow. Here a tramway line crosses the railway placed on a very high embankment. The first interesting point is that a tunnel is used here instead of a bridge, because the embankment is really too high. Secondly, there is the only section of interlaced tracks still existing in Moscow. 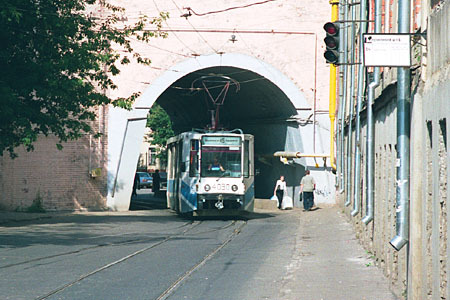 Another interlaced section beside Vagankovskiy Bridge was converted to an ordinary single-track with points in 2000, and was finally dismantled in 2002. 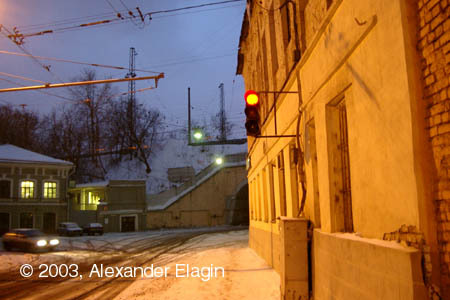 The tunnel and interlaced tracks seen from Bolshoy Poluyaroslavskiy Pereulok. Note how the tracks de-interlace. Another interesting point here is the interlocking signal on the wall (now red, but this is rather difficult to catch due to bright sunshine). The same signal is installed at the other side of the section. In the tunnel. 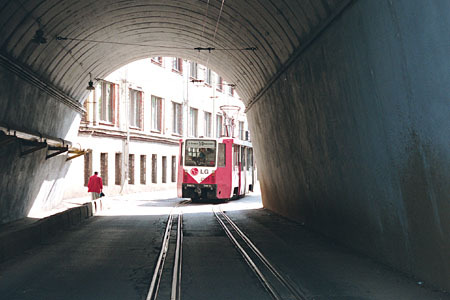 The 4107 tramcar has already left the tunnel heading for Bolshoy Poluyaroslavskiy Pereulok. Another view of the same place, now looking south. Here you can see a part of the tunnel ramp and the dedicated tram signal guarding the interlaced section. A view of the interlaced section in Syromyatnicheskiy Proyezd, looking north. 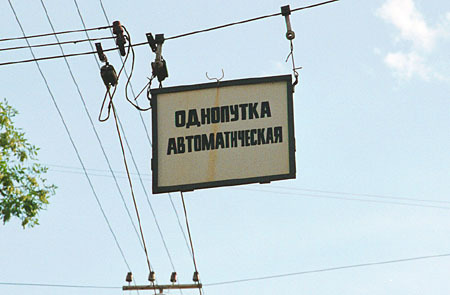 This sign in Syromyatnicheskiy Proyezd reads "Automatic Single Track Section" (although "single track" and "interlaced tracks" are different terms). This interlaced section is indeed equipped with a relay interlocking system and signals preventing more than one tram to enter the section.